At the Campbell Law Firm we are passionate about creating innovative, results-oriented legal solutions to resolve the financial problems of our clients. We call this, "Giving You Peace of Mind." Contrary to what some people may believe, filing for bankruptcy protection is still available even after the 2005 amendments! In fact, as our nation goes through difficult financial times, more and more people need to be aware that our laws can offer them well-deserved protection. Rather than struggling with debt, you need to take advantage of the protections these laws afford you. We use innovative technologies that allow us to respond quickly and give you up-to-date information and perspectives. We are committed to achieving the best outcome for every client. Since the Bankruptcy Court is centrally located in Charleston, SC, our service areas include, but are not limited to, Mt. Pleasant, Charleston, Summerville, Moncks Corner, Beaufort, Hilton Head, Walterboro, Georgetown, and Myrtle Beach. The Campbell Law Firm's clients have traditionally come from all of these areas. 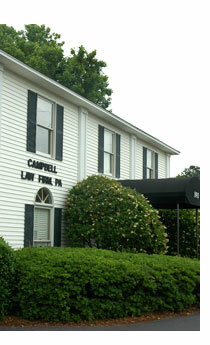 Although the Campbell's Law Firm's office is located in Mt. Pleasant, meetings can be in person or by telephone. We are extremely successful at what we consider the essence of our relationship with our clients, communication by correspondence, emails and fax. Take the first steps today! Call us at 843-884-6874 for a free consultation.